Beginning with a provisional cast-on along the back bodice and sleeves, the yoke and sleeves of this pullover are worked in ribs that run up over the shoulders—with a few increases and decreases to shape the sleeve caps—then down to the lower front bodice. 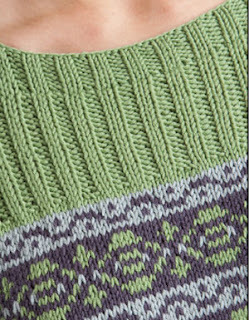 The sleeve stitches are joined with a three-needle bind-off, then the body is worked in rounds in a relatively simple Fair Isle pattern for a fine balance of texture and color. The foundational concept for this sweater design came to me from something designed by a friend of mine—Melissa LaBarre. While we were walking around the show floor at TNNA we came upon her sweater and she described its construction to me. I fell in love with it and immediately asked her if I could use that idea—she said of course! I continued to expand upon the construction to make the design seamless and fitted around the shoulders. 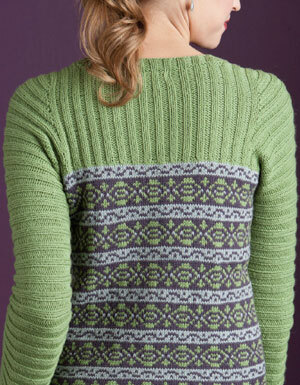 Interweave Knits recently published a similar design of mine (the Blooming Forest Pullover) in their Fall 2012 issue. 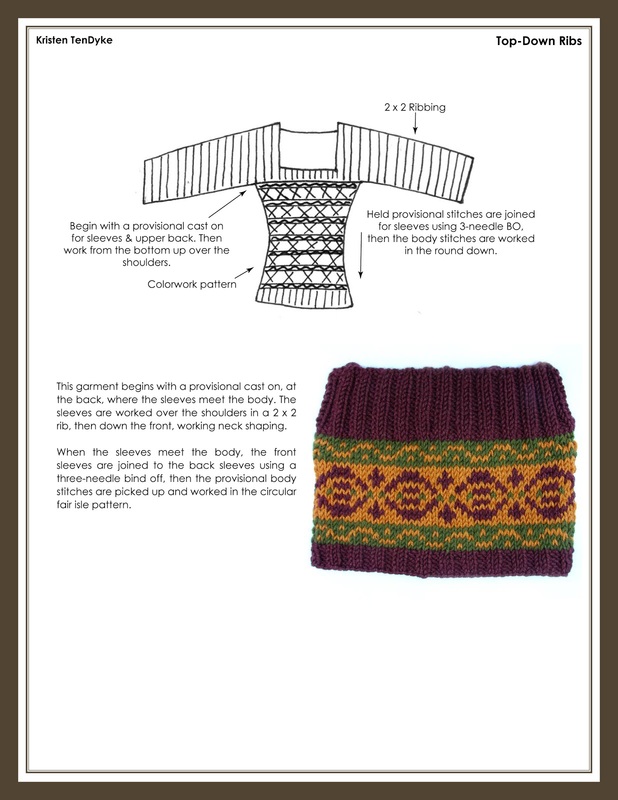 Eunny Jang goes into detail about the construction of it in a Sweater Workshop post on Knitting Daily. 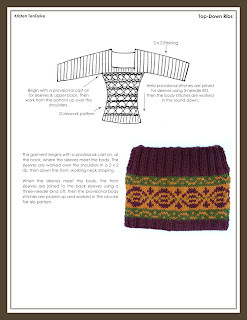 The Balance Pullover is constructed very much like the Blooming Forest Pullover and the Sweater Workshop post does a great job at explaining, with illustrations and all! The first swatch I knit for the Balance Pullover was knitted in different colors from the finished sweater. There were so many great color-combinations to choose from! My suggestion for working with multiple colors is to always knit a swatch in the pattern to get an idea of what they'll look like together. If you have three colors you love, play with them in different places to see how they interact with each other. For example: I wanted to be sure colors B and C were contrasting to each other so it would be obvious in the Wave Pattern that there are two different colors. For the colors in the finished sweater, I tried a swatch with the dark grey and the green switched, but the green and light blue didn't contrast enough to make the wave pattern visible. Someday, Janet! :) Keep at it & you can do it.